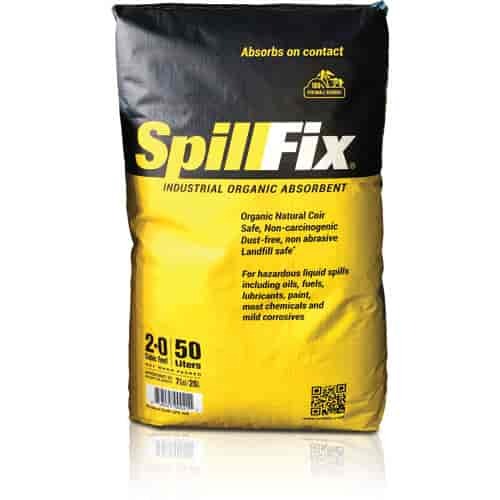 SpillFix is an effective Organic Absorbent made from coconut by-product. This "Green" product has a very small carbon footprint and no trees, mining or excessive transportation are involved in it's production. It has the ability to absorb all types of hazardous and everyday use liquids, even paint. It will remove spills and stains from driveways, garage floors and pit areas with ease. Use it to clean hands, tools and equipment, as it is safe and nonabrasive. This revolutionary spill absorbent works instantly and can be re-used over and over again. Compared to it's competitors products, SpillFix is more affordable, easier to use, more absorbent, safe to breathe and can be disposed of in landfills. SpillFix is harmless to humans, animals and completely safe for the environment. SPL-50L is rated 5.0 out of 5 by 3. Rated 5 out of 5 by Bakn8r from Great product! This is an amazing product! Cleans like a champ!!! Rated 5 out of 5 by Dogsloved from Worth trying! I bought this few weeks ago I saw a blip on TV showing what this product could do . I tried it on my carpet ....the example on TV demonstrated it sprinkled on dog poo. It was Effective pulling out moisture , odor and the mess you used it for!